A member of Warminster Town Council staff has made an eight foot high Christmas tree from empty plastic bottles. Sally Ward made the tree entirely in her own time to highlight the Warminster community litter pick. The tree is called “The Salvaged Spruce”. It took over a month to make and contains around 200 empty bottles. Town Councillors have been hugely impressed with the tree and have praised Sally for her hard work and inspiring creation. 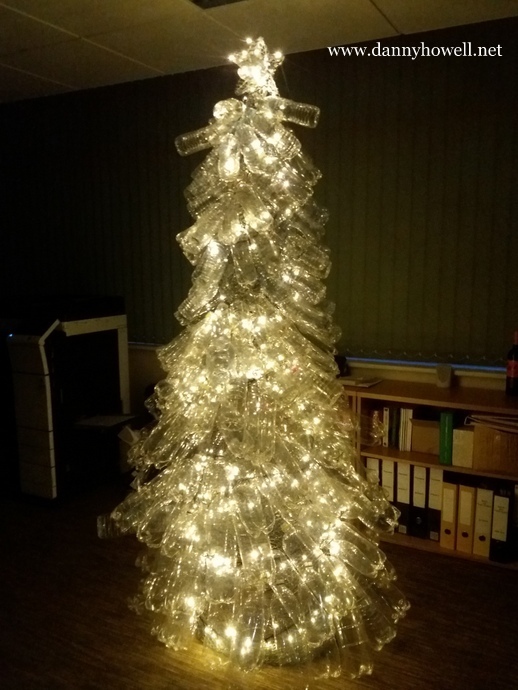 The message of the tree is about the importance of the environment and the need for people to reduce their use of materials, particularly plastic, and to encourage reuse and recycling. The tree is currently on display in the Warminster Civic Centre and will soon be moved to the Parish Church of St. Denys (The Minster) as part of their Christmas Tree Festival. made of plastic bottles by Sally Ward. The community litter picks are usually held on the first Saturday of every month and target a different part of Warminster each time. All the litter pickers, be they members of the public, Councillors or Council staff, are volunteers. Anyone is welcome to join the litter pick team. The next litter pick will be on Saturday 2nd February 2019. Further details will be posted on Warminster Town Council’s website and Facebook page or you can register with the Council to get an email alert.